Buno Pati (B.S. '86, M.S. '88 and Ph.D. '92, electrical engineering) was inducted into the Clark School's Innovation Hall of Fame on October 15 for his innovations in phase-shift lithography, which have driven the development of smaller and smaller electronic devices with ever expanding applications. Pati's work has improved the capabilities of everything from computers to cell phones to GPS devices to MP3 players. Pati is a member of the Clark School Board of Visitors and the University of Maryland Board of Trustees. For more information on Pati's work and recent ventures, please refer to the Fall 2009 issue of E@M Magazine. An article about Pati is available online. 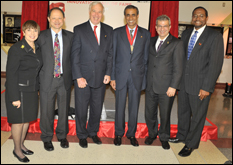 The induction ceremony was followed by the Charles and Helen White Symposium on Engineering Innovation, "Connected 24/7: How Today's Electronics Influence the Way We Live." The symposium included a talk by Phil Wiser, co-founder, chairman and president of Sezmi Corporation and former chief technology officer of Sony Corporation of America. He spoke about how today’s electronics are changing the user experience of music, TV, games, and the web, and their impact on business. Derek Hansen, assistant professor of information studies and director of the Center for Advanced Study of Communities and Information at the University of Maryland, also spoke. He addressed how today's electronics are enabling online mass collaboration for scientific data capture, social interaction studies, and healthcare. Michael Silberman, co-founder and director of EchoDitto, Inc. and manager of the Howard Dean campaign Meetup operation spoke about how today's electronics are changing political campaigning. Finally, Buno Pati also addressed the crowd. The panelists then participated in a question-and-answer session led by Dean Darryll Pines. A recorded webcast of the symposium is available online.